The European Space Agency recently released this video from Mars Express’ low-resolution Visual Monitoring Camera, covering 10 orbits of the red planet. It’s quite beautiful. Both animations are in black and white, because the images returned by Cassini are all black and white; to get color, the same image is shot three times through different filters, and then a technician has to manually colorize and assemble them. 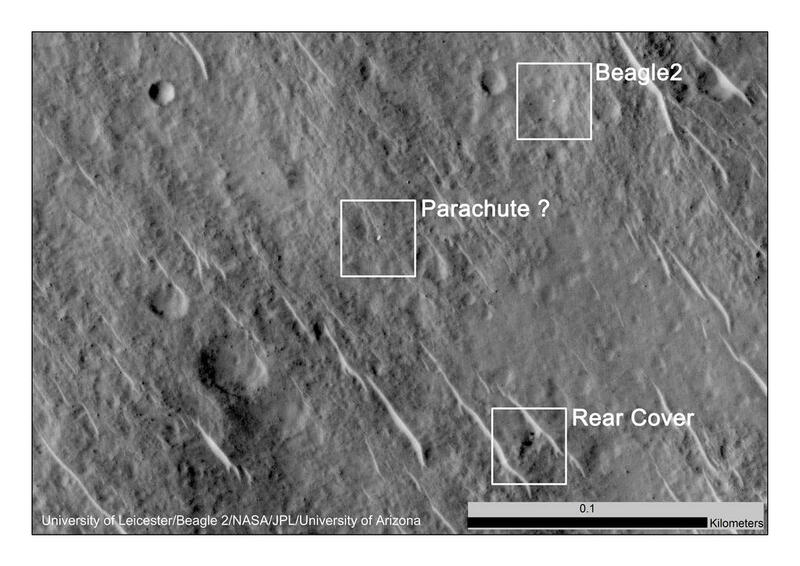 This was widely rumored since Wednesday and announced publicly yesterday, and it’s awesome: Mars Reconnaissance Orbiter has located the lost Beagle 2 lander, Britain’s first and so far only attempt at landing on another world. And although the pictures can’t tell us exactly what happened, they do rule out some possibilities, and confirm that whatever went wrong, the landing was actually successful. In December of 2003, the Beagle 2 probe separated from Mars Express. The last signal heard confirmed safe separation, but nothing further was ever heard from it. That’s something every planetary lander team has on their mind, because an enormous number of things can destroy a mission at this critical stage. Did it land in the shadow of a boulder, big enough to shade the solar panels but yet too small for existing Mars orbiters to spot? (MRO would not arrive for several more years.) Did it land in a gully too narrow to allow the petals to open? Was it operating find, but unable to communicate? Or did one of the many different things that must all happen precisely on time in order to deliver it safely fail? Did the parachute fail to deploy? Did it deploy but become fouled? Was the heatshield to thin, or did it contain an undetected defect that let too much heat in? Did the backshell not separate? Did the airbags fail to deploy, leaving the probe to shatter on the surface of Mars? The pictures rule out a lot of those possibilities, because they show it on the surface of Mars with at least two of its petals open. (This is near the limits of MRO’s abilities, so it’s hard to be sure if any other petals failed to open.) And they believe they have also found the backshell and parachute. So whatever went wrong, it went wrong after landing — the landing system performed correctly. Astronomers around the world are getting to watch an amazing event tomorrow — a very close flyby of Mars by Comet Siding Spring. Normally, this would be just a curiosity (since astronomers have ruled out the possibility of a collision) but this is a very fortuitous time for the encounter — two ground vehicles (Opportunity and Curiosity) and five orbiters (Mars Odyssey 2001, Mars Express, Mars Reconnaissance Orbiter, MAVEN, and Mangalyaan/Mars Orbiter Mission) are all ready to observe. MAVEN is particularly fortuitous; it’s specialized for atmospheric observations, which makes it unusually well-equipped for this chance encounter with a comet’s tail. It won’t just be the seven vehicles at Mars observing the comet. Other instruments, including the Hubble Space Telescope and STEREO-A, will also be watching, as will ground-based observers here on Earth. Amateurs with larger telescopes (8″ or better) and favorable weather will be able to follow the comet as it approaches and passes the red planet. And if that weren’t exciting enough, the Orionids are starting up. That’s debris from Comet Halley, and it will peak in a few days. And on Thursday, many of us in North America (not all, alas) will be treated to a very nice partial solar eclipse. It’s a good week! Tomorrow, Mars Express is set to make the closest flyby ever of the innermost moon of Mars, the doomed Phobos. Tiny, resembling a potato, and possibly either a captured asteroid or shrapnel from a massive impact on the Martian surface, Phobos is sinking about a centimeter per year, and already is so low that on the Martian surface you may see it rise twice in one day. Little is known of the tiny world, but tomorrow’s flyby will provide the best measurements yet of its mass, as Mars Express passes a mere 45 km from the surface. This is much too close for Mars Express to photograph the world, as it will be traveling so rapidly relative to the spacecraft that it would be just a blur, but scientists monitoring the signal from the spacecraft will be able to measure tiny shifts as the gravity of Phobos deflects the spacecraft ever so slightly, providing the opportunity for the most accurate estimate of its mass yet and even allowing them to probe the interior mass distribution.